What is Sample Selection Bias? Sample selection bias is the bias that results from the failure to ensure the proper randomization of a population sampleBasic Statistics Concepts for FinanceA solid understanding of statistics is crucially important in helping us better understand finance. Moreover, statistics concepts can help investors monitor. The flaws of the sample selection process lead to situations when some groups or individuals in the population are less likely to be included in the sample. The presence of sample selection bias may distort the statistical analysisQuantitative AnalysisQuantitative analysis is the process of collecting and evaluating measurable and verifiable data such as revenues, market share, and wages in order to understand the behavior and performance of a business. In the era of data technology, quantitative analysis is considered the preferred approach to making informed decisions. of a sample and affect the statistical significance of the chosen statistical tests. In addition, the statistical parameter is overstated or understated and is not representative of the entire population. Although survivorship bias is commonly considered separately, it is a special type of the sample selection bias. Self-selection happens when the participants of the study exercise control over the decision to participate in the study to a certain extent. Since the participants may decide whether to participate in the research or not, the selected sample does not represent the entire population. The participants of the study are selected from certain areas only while other areas are not represented in the sample. Some groups in the population are excluded from the study. Survivorship bias ccurs when a sample is concentrated on subjects that only passed the selection process and ignores subjects that did not pass the selection. The survivorship bias results in overly optimistic findings from the study. The participants of the study are recruited only from particular groups. Thus, the sample will not represent the entire population of the study. How to Overcome Sample Selection Bias? 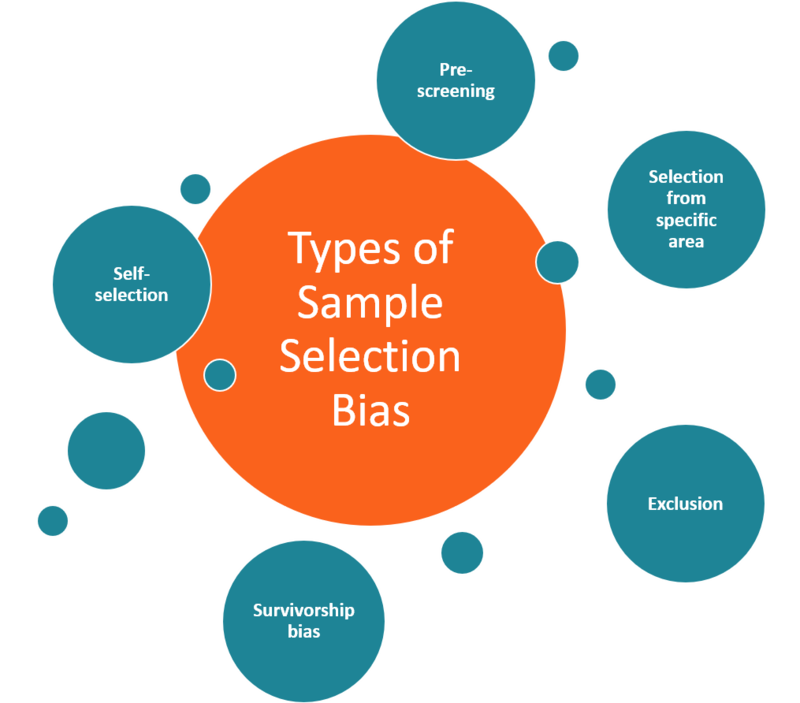 Since sample selection bias may significantly distort the results of the study and lead to erroneous conclusions, a researcher should know how to deal with this type of bias. The most obvious method is the establishment of a random sample selection process. By analyzing the population of the study and by identifying the subgroups of the population, a researcher must ensure that the selected sample represents the total population as much as possible. However, if some of the population subgroups in the selected sample are underrepresented while other groups are overrepresented, a researcher may apply a statistical correction. The misrepresented groups may be assigned weightsWeighted MeanThe weighted mean is a type of mean that is calculated by multiplying the weight (or probability) associated with a particular event or outcome with its that will correct the bias. Framing BiasFraming BiasFraming bias occurs when people make a decision based on the way the information is presented, as opposed to just on the facts themselves. The same facts presented in two different ways can lead to different judgments or decisions from people.